These videos are from the second time Fugazi played a WKDU show at Drexel. I shot a few videos with my Pixel camcorder from tthe side of the stage. I was hoping to move around but the show was very crowded. So all the pixel video are from the side of the stage with Guy and Joe on it. I have no idea what the order of the songs was but this is all I had. The other video was by another KDU guy Ken and was with real cameras so the quality is a lot better (for DUTV). 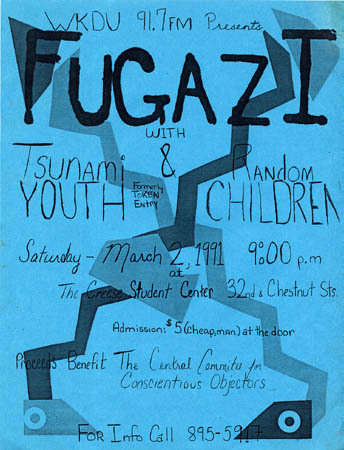 Fugazi always put on a great show but this one was not as crazy as the first KDU one that was at the Drexel parking garage I don’t seem to have a flyer for this show but I took a few screenshots. All these videos are up on the freedom has no bounds You Tube channel. On that channel I’ve started to collect some Philly bands and shows from Philly in the favorties section.